The nearest I got to celebrating the Queen’s official birthday today was making some fruit scones. But I did use the recipe that appeared in the most recent National Trust magazine, for maximum British overtones. Usually I stick to cheese scones, and attempt to make them part of a meal, with soup and a salad. 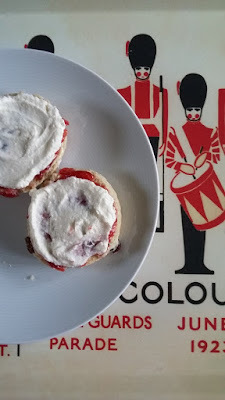 But today we went full on cream tea, chucking in shedloads of sultanas, and eating them with a pot of yellow-stickered whipping cream picked up in the Co-op and plenty of strawberry jam. Scones have the advantage that they’re quick and simple to make. You might have to buy some cream specially, but the other ingredients are cheap and cheerful storecupboard staples. Rub the flour into the margaine until the mixture resembles fine crumbs, or put the whole lot into the bowl of an electric mixer and let the mixer do the hard work for you. Add the egg, and gradually mix in SOME BUT NOT ALL of the milk – only 150ml / quarter pint – to make a soft dough. Knead lightly on a floured surface then roll out thickly to a generous 2cm thickness, or two fingers. Stamp out circles using a 7cm / 2 and three quarter inch fluted biscuit cutter and transfer the scones onto a lightly oiled baking sheet. 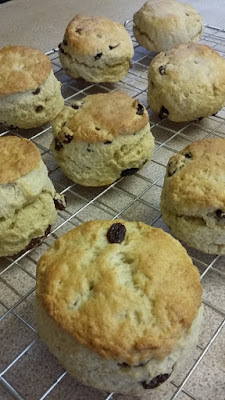 Brush the top of the scones with a little of the remaining milk, then bake for 10 to 15 minutes until well risen and golden brown. Leave for 10 minutes or so, then transfer to a cooling rack. 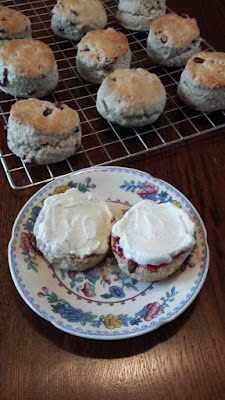 I lost my nerve faced with the value range self-raising flour, and bunged in a teaspoon of baking powder, and the scones definitely rose to the occasion. It turns out it’s actually quite tricky to cut through cooked sultanas with a biscuit cutter – who knew? Anyway they went down well with the whole family. According to my six-year-old son, they tasted so good “they make my toes wiggle”. He then asked for another one, so I’m assuming that was a good thing. Anyone else partial to a cream tea on occasion?